Cutaneous lupus is characterized by lesions or rashes triggered by exposure to sunlight. What is cutaneous lupus? Systemic lupus erythematosus SLE is an autoimmune disorder affecting not just one but many organs and systems in the body like the heart, joints, skin, lungs, blood vessels, liver, kidneys and the nervous system. This article will be discussing one type of lupus disorder, the lupus of the skin. Skin lupus is characterized by lesions or rashes; however, there are skin lupus that are non-specific skin lesions. Skin lupus is triggered by exposure to sunlight resulting to rashes. A visit to your dermatologist may not give you a complete picture of your disorder, but a doctor specializing in systemic lupus erythematosus or SLE like a rheumatologist might address your problem more accurately. There are three types of skin lupus that usually affect women between 20 to 50 years old. The most common chronic cutaneous lupus is discoid lupus erythematosus (DLE). These are coin-shaped lesions that are thick, red scaly patches on the face specifically on the cheeks, nose and ears. DLE may also appear on the neck, upper back and back of the hands. These lesions are not itchy or raw. Lesions can also appear on the scalp that usually result to permanent hair loss if the hair follicles are destroyed. The mouth or the lips may also appear and if untreated may cause ulcers and develop into squamous cell cancer. SCLE can manifest in two forms of lesions. 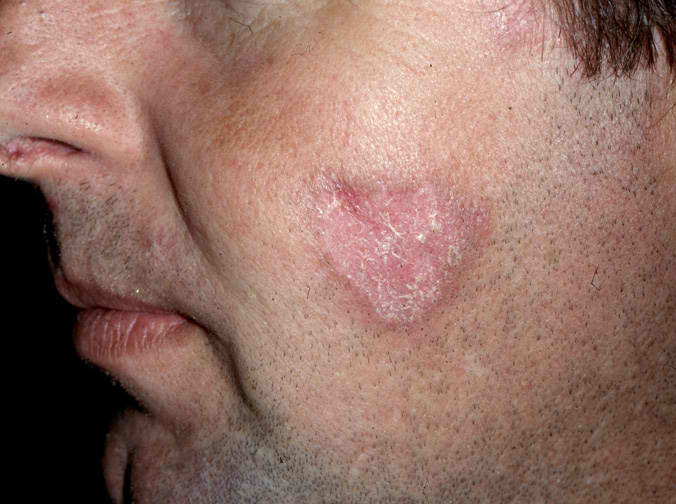 Papulosquamous lesions are red scaly patches that resembles psoriasis. Annular lesions, on the other hand, are ring-shaped and a bit scaled on the edge of the lesions. SCLE usually appear on the chest area, upper back and neck but can also be develop on the face and arms. The lesions are not itchy and may not be linked to any systemic disease although subacute cutaneous lupus patients may also complain of joint disorders. Lupus patients with systemic disorder manifest ACLE characterized by flat red patches on the cheeks and nose that resembles sunburn. This is referred to as butterfly rash or malar rash which is highly sensitive to sun rays and tanning rays. Lesions may also include oral ulcers, hives and temporary loss of hair which can grow back after disease flare has been treated. Proper evaluation and assessment backed up by complete medical history, physical examinations and laboratory results are very important when diagnosing cutaneous lupus. Discoid lupus may not show any abnormalities from laboratory tests however the ANA (anti-nuclear antibodies) may also reveal anemia or abnormal decrease of red blood cells. Skin biopsy and direct immunofuorescence tests are used for skin lesions to know which antibody depositions are within the skin. Cutaneous lupus can be treated in many ways. Use sunscreen protection. Avoiding exposure to sunlight is also important to avoid flares. Apply corticosteroid creams or ointments, or for severe cases, corticosteroid injections are preferred. ACLE with systemic disorder responds positively to medications like prednisone or immunosuppressive drugs. Widespread cutaneous lupus may be prescribed with antimalarial pills with potent anti-inflammatory properties (hydroxychloroquine, chloroquine). However, when taking these medications, regular eye exam and blood testing are needed. Always consult with your dermatologist or lupus specialist what treatment is best for you. Hello, thank you for this information. I have just been diagnosed ( well sort of I guess it is too early to be sure) with SCLE and also have joint involvement. I am finding it difficult to find research or information that supports the idea that patients with SCLE can also have accompanying joint involvement. I was exposed to uncovered fluorescent lighting at work and am in the middle of filing an occupational exposure claim and would love any help in finding any information that could help support my claim. it is amazing how many health professionals are not aware of the connection. I am a nurse and was unaware. Now I want to not only fight for myself but try to prevent others from becoming ill due to uncovered fluorescent lighting. It would really appreciate any information you may have about SCLE.